Karen O’Connor and husband (and current USEF President) David can certainly be considered in the top tier of the equestrian world. Karen has been named USEA Lady Rider of the Year ten times, and USEF Equestrian of the Year in 2007. David won the USEF Equestrian of the Year twice. And this is just the tip of the iceberg. For Karen, this level of performance requires more than the typical “hard work and talent.” It also requires that both horse and rider stay in top condition throughout the year. That’s not always easy, especially in her sport. “We ask so much of eventing horses.” Karen says. 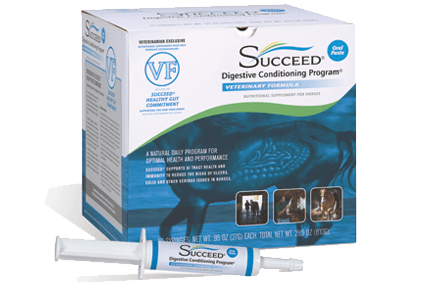 What Karen discovered is that a horse’s digestive health is a delicate system that can be imbalanced by the challenges of modern performance horse management. 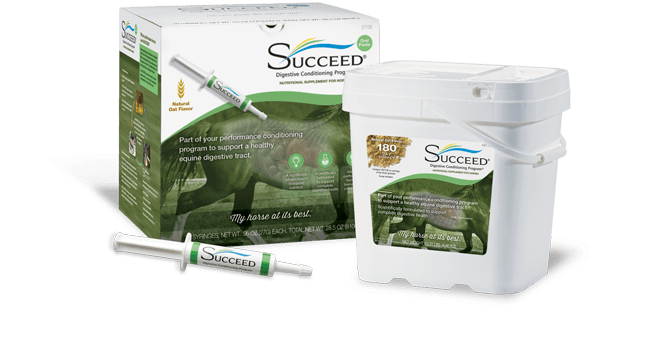 A unique, daily Functional Feed program, SUCCEED maintains the health of the entire equine digestive system. And the O’Connor Equestrian Team now knows, this can directly affect the horse’s complete condition – appearance, temperament, performance…everything.